Roll your clay to 1/4″ thickness using a rolling pin. Cut out 15 discs using a cookie cutter(ofcourse an extra one in the kitchen not used for cooking) if not use the cap of any small jar like the paint bottle. Start with a dark shade and by adding white clay to it lighten it as and when to create the ombre effect. Spread the discs on a foil lined baking sheet. Make a hole in the center of each one using a toothpick and bake according to the instructions given in the clay package. String the discs when finished. 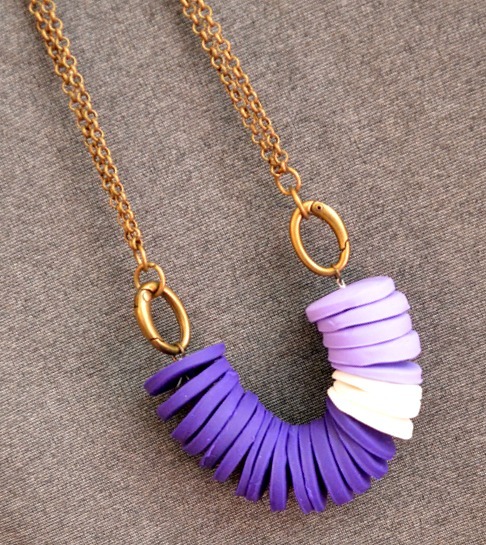 If you desire the neckpiece to be a very simple one then just string them on a piece of cord, string or leather. If you like the chain look better string the discs on a piece of wire and secure each end with a crimp bead and a jump ring.